This course is intended to provide an overview of performing Composite Analysis and Optimization using HyperMesh and OptiStruct. Students will learn the basic concepts about composite and how to perform analysis and optimization on models with these materials. 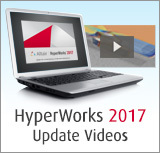 This is a theoretical and practical course that covers all design steps for systems manufactured with composite materials using an automated optimization technique developed inside HyperWorks.